Charlie Allum is a Notting Hill legend, a boxing champion who tragically lost his life in WW1 serving his country in France. 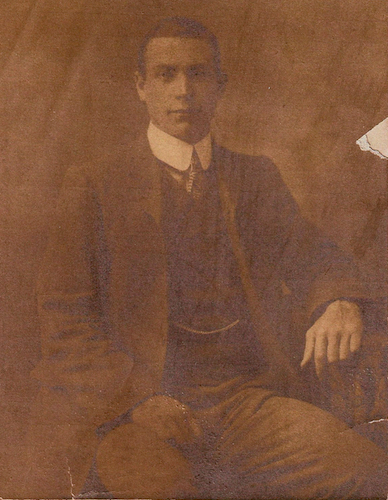 Son of Mrs Rose Ellen Allum of 296 Lancaster Road, Notting Hill, husband of Millicent Maud Allum of 189 Lancaster Road, Notting Hill. Colin Woodley contacted Chris Allum via his Ancestry family tree, who then kindly gave his permission for us to replicate the following article which was written by Alex Daley, the author of ‘Nipper: The amazing Story of Boxing’s Wonderboy’. Visit: www.nipperpatdaly.co.uk for more information. ‘Charlie Allum distinguished himself as a fighter within the roped square and through the mud and blood of the battlefield. When his end came suddenly on some remote French field in July of 1918, few who knew the man were surprised to learn he had died just as he had lived – he had gone down fighting. Born on 23rd April 1876 in the then less than salubrious West London district of Notting Hill, like most boxing-mad youth of the area, Allum joined the renowned Rugby Amateur Boxing Club on Walmer Road in Notting Dale, and at 20 he won the Old Guards‘ Challenge Cup at catchweight (any weight). The following season he won the Belsize BC Open 10-stone competition, a much-respected and hotly contested prize. A year later, in 1898, newspaper coverage shows he beat C. W. Humphries, C. J. Clarke and Albert Brewer, the last of whom accused Allum of being a pro masquerading as an amateur, so accomplished was his display. The outbreak of the second Boer War in 1899 halted Charlie’s ring career, as he eagerly signed up with the Second Royal Fusiliers to join the war effort in South Africa. By then he was captain of the Kensington Amateur Boxing Club, and widely acknowledged as one of the best 10-stone amateurs around. He took part in most of the war’s key engagements, including the relief of Ladysmith and the capture of Pretoria. When he finally returned to Britain in 1902, after three years’ service, he had won two medals and seven bars. Within a year of his return Allum joined boxing’s paid ranks and had his first pro fight at Covent Garden’s National Sporting Club (NSC), where he stopped Ted Francis in two rounds on 23rd February 1903. This he quickly followed by entering an NSC 11-stone novices competition on 12th March. Fighting four men in a single night, Charlie battled his way to the final, but was beaten by Bill Curzon of Bloomsbury, who KO’d him in two rounds. Despite this setback, Allum soon recaptured his form with a string of contests at the Wonderland Arena on Whitechapel Road, then on 12th September 1903 tackled leading welterweight contender Charlie Knock of Stratford. Knock outpointed Allum, but the fight had been so close that the pair were re-matched two months later for the Welterweight Championship of England – and the then princely sum of £160. After eight rounds of furious action, Allum floored Knock in the ninth for the full 10 seconds to win the English 146lb title and recognition as one of Britain’s finest fighting men. But Knock, thirsty for revenge, outpointed the Notting Hill man three months later in a return for a silver cup and a purse of £275. After a few more fights – and several losses – at welter, Allum entered the middleweight class and his entry into this weight sphere seemed to revitalise his career. First he captured the English (then 150lb) middleweight title from Jack Kingsland with a tenth-round stoppage at the National Sporting Club, on 27th February 1905. He followed this with KO wins over Birmingham’s Harry Smith and Willie Burke, before drawing with the highly talented Pat O’Keefe and outpointing Bill Higgins, in a bout in Paris. O’Keefe had moved from welter to middleweight at around the same time as Allum and the two were fierce rivals. Allum had outpointed O’Keefe in a welterweight battle in 1904, but the latter’s 1905 draw with the champion revealed him as a much-improved fighter and earned him a shot at Allum’s middleweight crown, made for 23rd April 1906. On this occasion O’Keefe was in formidable form and knocked out Allum in the sixth of a scheduled 15-rounder, taking Allum’s title in his very first defence. Two more knockout defeats followed for Allum, one at the hands of Frank Craig – the “Coffee Cooler” – and the other again by O’Keefe. Charlie had one final crack at O’Keefe in September 1907, but once more finished second, this time losing on points. After that the former welter and middleweight champion threw weight considerations aside. He gamely took on men of all weights for the next four years, often conceding stones and winning more than he lost, before retiring at age 35 in 1911. Also used with permission, the above pic is of a piece of paper found with Chris’s Great-Grandfather’s (Bertram Allum) belongings. In 1915 he travelled to France as a sergeant with the Royal Fusiliers to once more serve his country – in “the war to end all wars”. He died on 21st July 1918 during an attack on a German machine-gun nest. Reportedly, after having helped dispose of a number of enemy positions, Charlie made his way to the German lines, mistaking them for his own. He was last seen fighting a group of German soldiers – with his bare fists! He was posthumously awarded the Military medal for bravery, and although he has no known grave, his name is commemorated on the World War One memorial in the cemetery at Ploegsteert in Belgium. Although Charlie Allum’s fighting days finished in France in 1918, the former champion’s son, known as “Young Charlie Allum”, kept the family name alive when he fought as a welterweight during the 1930’s. A remarkable story of a true Notting Hill legend. “Ignorant Beasts!” – Bill West of the Goldhawk Road wasn’t very Happy with some Rangers fans!